Abstract: During the 1920s and 30s, as the Underground network expanded outwards and passenger numbers increased, Tube stations were designed (or redesigned) with a particular emphasis on speeding up and regulating the flow of passengers from the streets onto the trains. 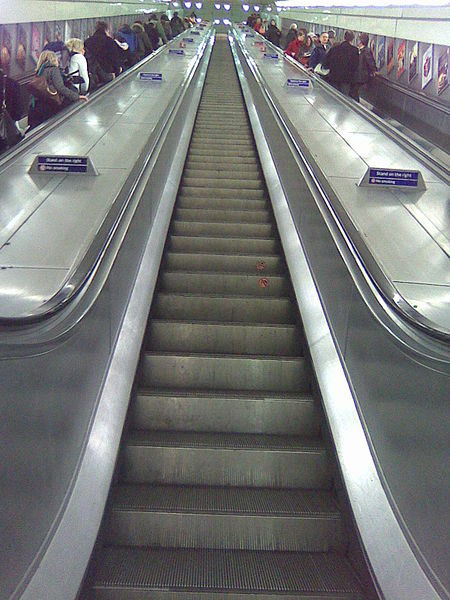 The symbolic and spatial centres of these new designs were the automatic escalators, a technology that accorded with the Fordist conveyor belt and which deployed similar logics of individuation, regulated (im)mobility and unthinking, disciplined habit. This paper returns to the early years of the Underground escalator to explore what was at stake within this administrative technology and how it reconfigured the historic relationship between architecture, the Underground environment, and corporeal patterns of movement and attention. Biography: Richard Hornsey is Senior Lecturer in Cultural Studies at the University of the West of England, Bristol, and the author of The Spiv and the Architect: Unruly Life in Postwar London (University of Minnesota Press, 2010). He is currently working on a project about the bureaucratisation of movement in interwar London, including an exploration of the administrative choreographies then being built into the Underground. His article ‘Listening to the Tube Map: Rhythm and the Historiography of Urban Map Use’ is coming out in Environment and Planning D: Society and Space in August 2012.